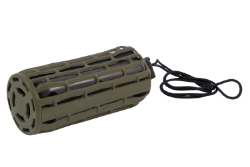 The Battle Bag is the most innovative, volume carrying antler rattle package to enter the woods! The flexible bag that holds the Battle Sticks keeps them quiet while traveling, the attached lanyard allows the hunter to hang it where you need it, and when you want to get after it and make the loudest fight in the woods, the open air rubber flex design allows you to turn up the Volume over any cloth rattle bags hand over fist. From early season sparring to Epic, height of rut battles, the Battle Bag is the call for you.